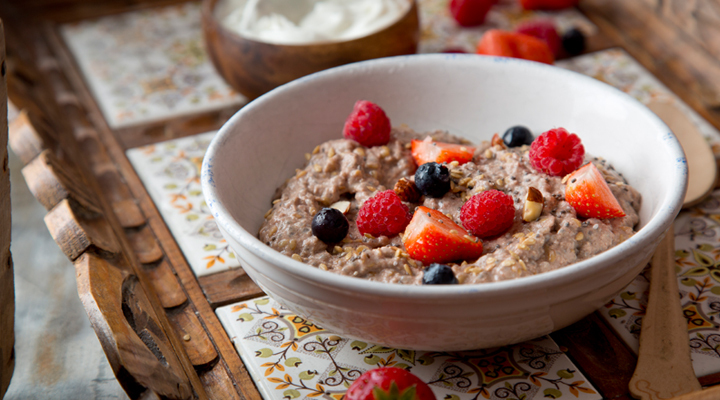 An alternative to the usual oat porridge, this version is rich in high-quality protein and antioxidants. The porridge includes flaxseeds and chia seeds, which are an excellent source of fibre and omega-3 fatty acids. 1. Combine all the ingredients except the cacao nibs in a pot set on a low heat. Cook, stirring frequently, for 5 minutes, until the porridge reaches your desired consistency. Remove from the heat, transfer to a bowl and sprinkle the cacao nibs on top. Serve with a spoonful of Greek yogurt and some fresh berries if liked. Tip: You can add nuts, seeds, nut butter or hemp protein powder to this if you would like to bulk up the porridge and increase the amount of energy.